The tents and containers used as temporary refugee accommodation are known to burst in the wind, collapse under snow, trap the stifling heat and provide little in the way of privacy or comfort for some of the world’s most desperate citizens. Thankfully some innovators are designing shelters to embrace their inhabitants, rather than adding to their desperation. “No one puts their children in a boat unless the water is safer than the land,” writes Warsan Shire. The same could be said for refugee accommodation: no one asks their family to live there unless their home can’t be a home anymore. The organisation More Than Shelters has combined innovative architecture and social design to produce a temporary structure for housing refugees that is currently in use in Greece and Germany. 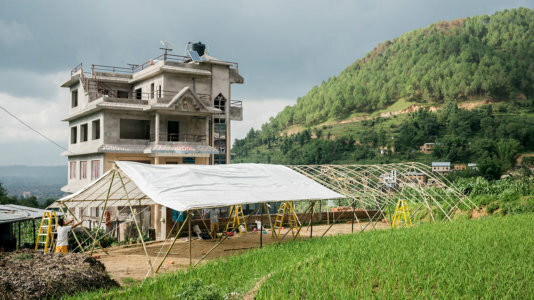 The dome-shaped tents were also used in Nepal following the 2015 earthquake. More Than Shelters comes at the issue of refugee accommodation from the perspective that people do better when they have the opportunity to help themselves. As their vision statement explains, their concept is about thinking differently. Armed with the knowledge that the average stay in a refugee camp is 12 years, this organisation keeps one eye on the long-term as well. With the need for both of autonomy and long-term solutions in mind, More Than Shelters has created the Domo, a modular shelter system. The Domo is able to change shape depending on the needs of its users, starting out as an emergency shelter but with the possibility to grow into a stable long-term home, depending on what a user or family of users needs. It’s made from materials that can suit a vast array of climate conditions and landscapes, and can be adapted to suit the needs of people from different cultures. People can stand up comfortably inside, and can even walk from ‘room’ to ‘room’ depending on the structure they have set up. On the Greek island Lesbos, where up to 2000 refugees were arriving by boat every day during summer 2015, a configuration of Domos were set up to receive exhausted refugees and provide shelter before they moved further on into Europe. 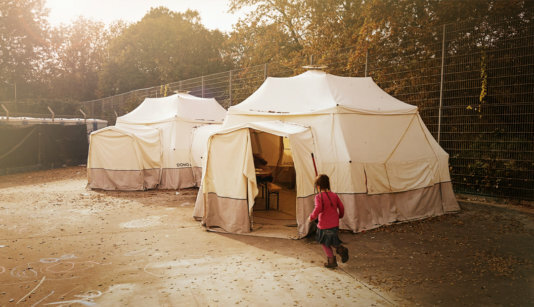 During the same high-time of migration across Europe, More Than Shelters looked to its home city, Hamburg, and provided a set of shelters to create social spaces for refugees in the camps where they were being housed. The pilot project used two Domos to create safe, private spaces for women and children in Hamburg’s exhibition halls, which was housing refugees at the time. In this way the organisation was able to respond to the specific social and cultural needs of the users, giving women a comfortable space to nurse their babies, remove their veils if they wished, and take some time out after their undoubtedly harrowing journeys. But responding to the human need for autonomy and self-determination has to be More Than Shelters’ greatest strength. As we have seen at the likes of Zaatari refugee camp in Jordan, refugees – like most humans – are keen to get on with shaping their lives for themselves. There, Syrian refugees have rearranged their tents to imitate the housing layouts from their neighbourhoods back home. Some have made work and income opportunities for themselves by offering utilities and home improvement services to fellow members of their community. The keenness of these people to self-determine cannot be ignored if it’s their homes that you’re designing. What else does the world have to offer? While corporate giants like Ikea may have the means to design and foot the bill for the shelters so desperately needed in refugee camps, this doesn’t necessarily mean they take into consideration all the delicate requirements of a refugee shelter. Or even the blatantly obvious ones: the city of Zurich purchased more than 60 Ikea-designed shelters in December, before ditching them after testing showed they posed a fire risk. But the scale of need for better-designed shelters hasn’t stopped independent designers from having a crack at the task. A strikingly beautiful pop-up tent captured the attention of the humanitarian sector when it won the Lexus Design Award in 2013. Designed by Abeer Seikaly, this tent is able to open for fresh air and light, close against the cold, and features a water basin at its base. It’s able to fold up for easy transport, and the designer is currently investigating tent materials that could collect solar energy to be used as power inside the tent. The design is not yet in use. The daughter of a Palestinian refugee herself, Seikaly understands the harsh and varying conditions a temporary refugee shelter must be able to withstand. Further, her design delivers beauty and distraction at a time of despair. Earlier this year, students from the Royal College of Art in London designed a wearable shelter, intended to be a coat for refugees that can turn into a tent. Looking at the garment, it appears to be better suited to Glastonbury festival-goers, or perhaps those queuing all night in the cold in the hopes of nabbing the latest iPhone, as online commenters were quick to point out. But design attempts like this shouldn’t be discounted. Distance, disassociation, and apathy are exactly what prevents us from moving forward together. Having designers and thinkers from across disciplines engaging in the world’s biggest challenges can only be a positive. Thoughtfulness and engagement with the humans who have to make these shelters their homes is what will make all the difference. "More Than Shelters" has combined innovative architecture and social design to produce a temporary structure for housing refugees that is currently in use in Greece and Germany. 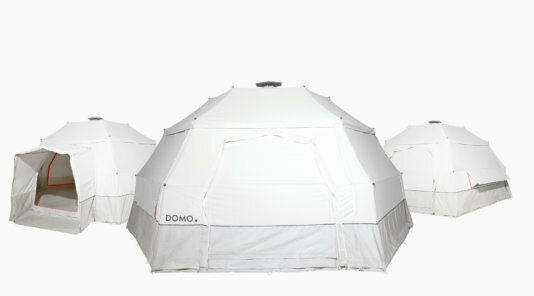 The "Domo" is able to change shape depending on the needs of its users, starting out as an emergency shelter but with the possibility to grow into a stable long-term home, depending on what a user or family of users needs.